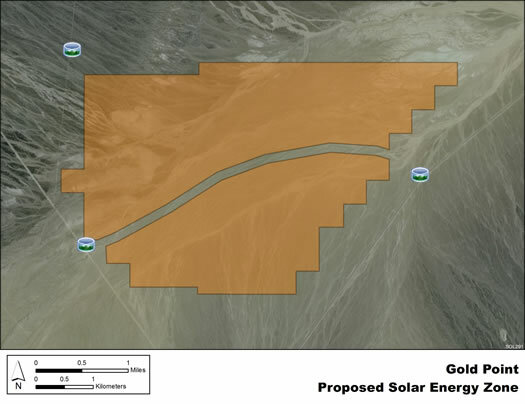 The Gold Point solar energy zone (SEZ) is located in Nevada in the Lida Valley in an undeveloped rural area. The SEZ is located on BLM-administered land within the Battle Mountain District. The Gold Point SEZ has a total area of 4,810 acres (19 km2). In the Supplement to the Draft Solar PEIS, 214 acres (0.87 km2) of a significant unnamed intermittent stream passing east-west through the center of the SEZ were identified as non-development areas, leaving the SEZ with a potentially developable area of 4,596 acres (18.6 km2). No additional changes to the SEZ developable area were made in the Final Solar PEIS. The Gold Point SEZ is located in Esmeralda County in southwestern Nevada. The SEZ is located in Lida Valley, which lies between Mount Jackson Ridge and Cuprite Hills to the north, and Slate Ridge to the south. It is bounded on the west by Palmetto Mountains and on the east by Stonewell Mountains. In 2008, the county population of Esmeralda was 664, while adjacent Nye County to the east had a population of 44,175. There are no incorporated towns in close proximity to the SEZ, but the small community of Gold Point is located about 2 mi (3.2 km) south of the SEZ. The town of Tonopah is approximately 50 mi (80 km) to the north. The Gold Point SEZ is in an undeveloped rural area, with very little topographic relief. Vegetation within the SEZ is predominantly scrubland, with shadscale, greasewood, and winterfat, with some Joshua trees. Playas occur in the northeast portion of the SEZ, and washes slope downward slightly from the southwest to northeast. Lands within and near the SEZ contain dirt roads and vegetation. Part of the SEZ is authorized by the BLM for grazing. The SEZ may be have limited use by local residents for general outdoor recreation, including off-highway vehicle use. The nearest major road access is State Route 774, which parallels the eastern edge of the SEZ; U.S. 95 passes within 9 mi (14 km) to the east of the SEZ. The nearest existing transmission line is a 345-kV north–south line located about 3 mi (5 km) east of the SEZ. As of May 2012, there were no pending solar applications within the SEZ.